Essiac Canada International - TRU-PINE® for Pets bringing 475 Years of Canadian History to Your Four-Legged Friends! 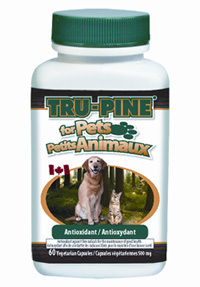 TRU-PINE® for Pets bringing 475 Years of Canadian History to Your Four-Legged Friends! Antioxidant Supplement for your dogs and cats well-being. In North America, pets have become increasingly popular additions to our families. Today, more than half the population of North America has welcomed our furry friends into their homes. Not only do our pets bring indescribable joy to our families, but they also provide us with unconditional love, and companionship, regardless of our age. Therefore, knowing which products to give to our pets is an essential way to ensure that we are fulfilling our duties as “Pet Parents”. Don’t forget that our pets rely on us completely! All quantities are maximum unless otherwise stated. *Not recognized as an essential nutrient by the AAFCO (Dog and/or Cat) Food Nutrient Profiles. Ingredients: Rose hips, white pine bark extract, vitamin C, hypromellose (capsule), vegetable magnesium stearate, microcrystalline cellulose. WARNING: This product was developed solely for dogs and cats. Keep out of reach of children, as well as other animals. Please call our office Toll-Free: 1-888-900-2299 or Int'l: 514-695-2299 for suggested daily usage.